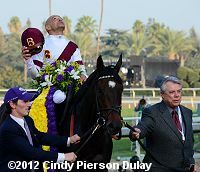 Jose Lezcano and Royal Delta after winning the Ladies Classic. The feature race on Championship Friday is the $2 million Breeders' Cup Ladies' Classic (G1), formerly known as the Distaff, contested at 1 1/8 miles over the main track and usually decides Champion Older Female and Champion 3-Year-Old Filly. Royal Delta was sent off as thethe 2-1 favorite in the field of 9, off her second plce finish in the Beldame (G1) after winning the Alabama (G1). In to challenge her included 5-2 second choice Plum Pretty, winner of the Cotillion (G2), and 9-2 third choice It's Tricky, second in both the Cotillion and Alabama. Jockey Rafael Bejarano sent Plum Pretty to a clear lead first time past the stands and she set fractions of 24.18, 49.00, and 1:13.72 over the good track, while stalked by It's Tricky and 16-1 Ask the Moon. Entering the stretch, Plum Pretty continued to lead through 1 mile in 1:38.12, but she tired in the final furlong. Royal Delta, 4th early, came through late to win going away by 2 1/2 lengths over It's Tricky in 1:50.78. It was another 2 1/4 lengths back to 13-1 Pachattack third. 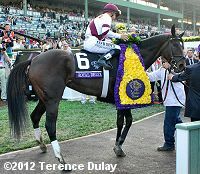 Left: Royal Delta circles before going into the winner's circle. 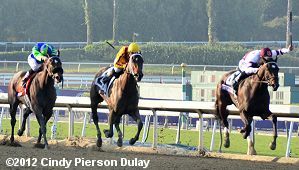 Winning trainer Bill Mott said, "I started to get a little worried at the 1/8 pole because the fractions were so slow early. By the time I started to worry, I saw her gain the momentum. Once she got going, it was adios. She ran really well. My whole staff did a tremendous job and we are so lucky to have a filly like that in the barn," Jockey Jose Lezcano added, "When I asked her, she gave me a very good kick. When we hit the 1/4 pole, I felt very comfortable that we would win the race. She's a fantastic filly." 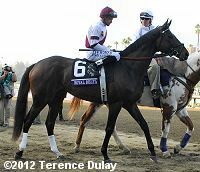 Right: Royal Delta in the post parade. 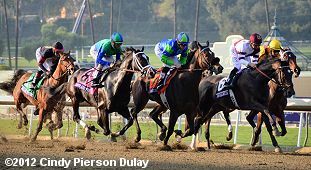 Winning jockey Mike Smith said, "She jumped extremely well today and her best races are whenever you can let her do her thing, let her get into her stride and normally that's laying a bit off the pace. When you have a mare with a stride that she has and as talented as she is the best thing to do is stay out of her way and that's what I did. We were cruising right along but she was doing well within herself. She does things so easy. It feels easier than what the numbers come up to be. But she'll cruise around there and you think she is going 47, but she throws up a 45. She has an enormous stride." Left: Second place It's Tricky in the paddock before the race. 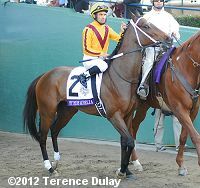 Her trainer Kiaran McLaughlin said, "She was second best. Congratulations to the winner. We didn't have any excuse. She ran great. 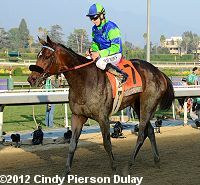 We were hoping Ask the Moon would take on (trainer Bob) Baffert's filly (Plum Pretty) and set it up more for us. But we ran well, we were just second best." Right: Third place finisher Pachattack in the post parade. Her jockey Rajiv Maragh said, "She gave me a good run. We were in ideal position saving ground and she was running well within herself and got into a nice flow. We had a good trip, but we were just third best today."